Summer has arrived, and now folks tend to spend more time outdoors with family and friends, enjoying parties and get-togethers, and also making preparations for the July Fourth holiday excitement including fireworks. But how do our pets feel about all that? Pets do get anxious. If only they could talk and explain how they are feeling. Instead, we have to read their body language and interpret their actions. Lots of new people, loud noises, thunder storms and fireworks often cause our pets stress. They may run for cover or cower in a corner. We have some advice on how to ease their discomfort and teach them to remain calm. 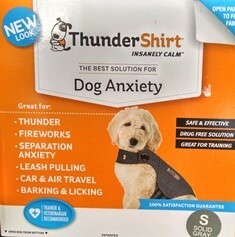 Thundershirts are a great way to help our pets stay calm when used properly. For example, if you buy a Thundershirt and put it on a dog only when there are thunder storms looming, the exercise will back fire. Dogs are so intelligent that they directly associate things and actions even quicker than humans. They will quickly associate Thundershirt = scary storm = I must run now! The trick is to put the Thundershirt on the pet under calm circumstances and let the pet get used to the clothing in a positive way. Thundershirts need to fit nice and snug to stimulate acupressure points that make the pet feel soothing, more relaxed sensations. We all like “hugs,” and that’s the sensation a pet feels while wearing a Thundershirt. So the trick is we need to nurture and create other multiple and different positive associations with the nice feeling compression of the Thundershirt. And Thundershirts are not just for dogs – cats can benefit too! We recommend buying a Thundershirt long before you anticipate needing it. Put it on the pet for short periods of time when you are doing positive fun things in and around your house and yard. For example, put it on your dog when you are giving really yummy treats or new safe chew toys or interactive smart toys. 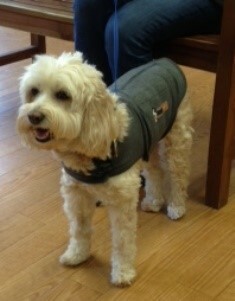 Put the Thundershirt on when you are playing with your dog or walking your dog. Put the Thundershirt on your pet while playing classical music! 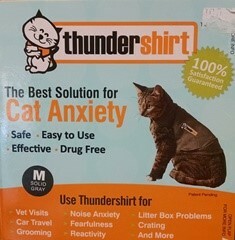 The idea is for the pet to associate wearing the Thundershirt with positive, fun circumstances. Then when a storm approaches, you can easily put on the Thundershirt in advance, and the pet will remain calm and cooperative with positive feelings that can be sustained through the event. 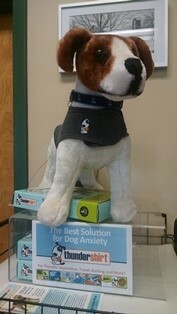 We do have Thundershirts available for sale in our reception area. Ask one of our receptionists for assistance the next time you stop by. The shirts come in a range of sizes from XXSM to XXLG and are dog and cat specific. Many storms bring in a high ionic atmospheric pressure. A dog’s cerebrospinal fluid in their brains is much more sensitive to this pressure than ours are. So if the dog has a true phobia, then they may get restless and panicky even before we humans hear thunder or see lightning flashes. Some dogs have been known to be so fearful that they run away, fall down steps, or jump through glass plate windows and doors, sometimes inflicting serious injury to themselves and those around them. Some dogs really do need sedatives and tranquilizers prescribed by their veterinarian to help them relax or sleep it off until the storm, fireworks, and actual panic attacks are over. Your veterinarian can help you figure out what helps your pet settle the quickest and by the easiest method. Whatever it is, Thundershirt or sedatives, do it as early as possible before the event – even hours before storms or fireworks. The best thing to do is keep the pet from running through the house or yard and hurting itself. Therefore, find a “safe place” in your home for the pet to take refuge. Take the dog to its safe place, preferably away from exterior windows and doors. Close blinds, play music, turn on fans, use lavender or even better, Dog Appeasing Pheromones and Thundershirts. Stay calm and relaxed with your dog in that safe zone. Don’t panic or nurture anxiety by being anxious or scared for them. Just be a calming, gentle, quiet source of comfort and security in the safest place you can create for your pet. Studies have shown music does have a calming effect on pets. Following is selection of music you can easily access online and find what works for your pet. Through a Dog’s Ear and Through a Cat’s Ear is music and sound therapy to ease a pet’s anxiety during many situations including thunder storms, fireworks, sound phobias, separation anxiety and more. Use the BMAH Website as an Educational Resource! Did you know you can now Search our website for particular topics of information and advice? Visit our Learning Center > Search this Site and enter a word or words of the subject you want to learn more about. We are constantly adding new material to our website and improving functionality to help serve you better.